This dress watch is simple and classically styled. 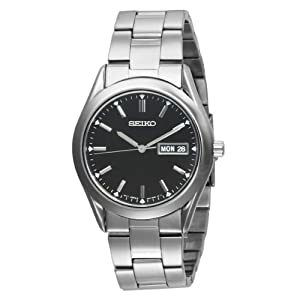 A stainless steel, silver-toned bracelet and case surround the black dial. Silver toned hands and hour markers make it easy to tell time. The time stays accurate because of the Japanese quartz movement. It has hour, minute and second hands. The 3 position displays the date and day of the week for added convenience. This is a classy watch that is inexpensive for what you get. A good value and a great gift for him.